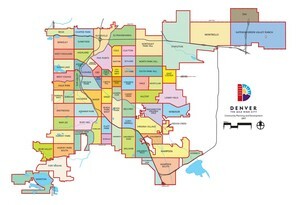 The Hale-Mayfair area of Denver is actually two conjoined neighborhoods. Filled with lush, mature trees on winding streets this community features a variety of home styles. From Victorian to ranchers to Tudor style homes, this mature 1950's neighborhood is undergoing a revival. Residents are reclaiming this striking urban community and restoring this area, making it one of the most sought-after locations in the city. Many of the homes in this area were built post-World War II and reflect the tastes and styles of the time. This community has a vintage feel, from a time when neighborhoods were true communities of people coming together. Many parks in the area offer entertainment and encourage interaction with friends and neighbors. Residents of the Hale-Mayfair area are conveniently located near many entertainment options. Within the neighborhood there are several unique small businesses and favorite neighborhood eateries. The Denver Zoo, the Botanic Gardens, and Washington Park, with its two large lakes, tennis courts and walking track are easily within reach. For those seeking a vibrant and close knit community with city convenience Hale-Mayfair is the place to call home.